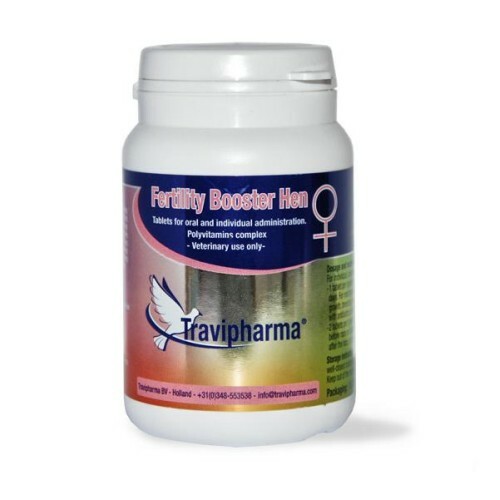 Fertility Booster Hen by Travipharma is a product support for optimal condition during the breeding season fertility in females, providing all the vitamins and nutrients needed for good reproduction. - Improved fertility and increases the desire to mate. - Increases the body's resistance to infectious or parasitic factors, increases the body's defenses, ideal for young pigeons. - To ensure good breeding: 1 tablet per pigeon (females) for 4 consecutive days prior to mating. - To pigeons with reproductive problems: 1 tablet per pigeon (females) for 7 consecutive days, before mating.